This item could organize your clothes just got simpler and infinitely tidier. Travel would be so much easier if you could take your dresser with you. Bye bye messy drawers and piles of shirts! Stack your clothes into neat, easily visible and rapidly accessible piles. Each rigid plastic organizer lies flat and steady. Fits neatly into your suitcase to keep your clothes from bunching and wrinkling. Use it in a suitcase and never unpack. Just pull your clothes from the middle. Also a compact desk organizer, great document organizer, file organizer and so on. 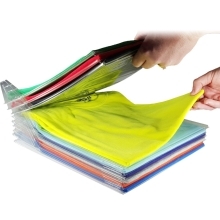 It is a folding template, you can fold them with many layers to stack more things.